We are pampered by our grandparents in our childhood with yummy snacks and dishes. 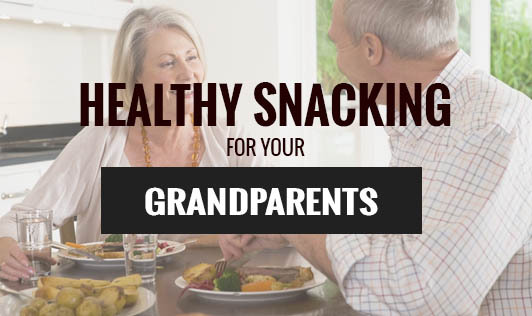 Have you thought of any healthy snacks for your grandparents? Their snacks should be healthy, tasty and match their appetite. Old age manipulates your appetite to a great extent and affects the way your taste buds respond. Some of them would like to try new foods; some of them would want to stick to their traditional snacking routine. 1.Fruits with curds: Low fat curds with cut fruit pieces is one the healthiest snacks. It's a combination of protein, fibre and calcium which are very important during old age. To add a little taste to it, you may add 1 tsp of chocolate sauce or 1 tsp of honey or very little chat Masala. However, make sure your grandparents do not have high blood pressure or diabetes. 2.Puffed rice: It is low in calories and is a wonderful snack from ancient times. Puffed rice can be made into different forms of bhel puri with various ingredients like sprouts, corn and khakhra. Sprouts bhel is rich in proteins and helps in maintaining muscle strength. Khakhra bhel and corn bhel are low on calorie and hence, can be a good snack. 3.Lotus seeds: It is a snack with low calories, low sodium and no sugar. Lotus seeds can be made into many snack forms. Lotus seeds with very little olive oil, chilli powder and salt can be a tasty snack in the evening. 4.Sugarless milk shakes: Low fat milk and fruit can be blended and served chilled. Very little chocolate sauce or strawberry sauce can be added as a topping. This doesn't add too many calories and can make a huge difference to their taste buds. 5.Deviled eggs: Deviled eggs are a great source of protein. Boil the eggs until hard (ten minutes). Drain the eggs and then cool with cold water or refrigerate them. Remove the shells and slice the eggs in half lengthwise. Remove the yolk with a spoon and place the yolks in a dish. Add mayonnaise to the yolks and stir until moist and creamy. Spoon the yolk mixture into the egg hollows and sprinkle with paprika. Serve chilled. 6.Simple snack: 1/4 cup of almonds and a banana, with a serve of whole wheat crackers. Add it with low fat cream and serve immediately. It's a good idea to portion out snacks in advance so you don't lose control of how much you eat because healthful snacks still have calories. Also, allow yourself an occasional indulgence rather than trying to forgo these foods altogether. The key is portion control and frequency for some of these little indulgences.